Hi folks. Today I would like to discuss something that I came up with that helps me stay on track. 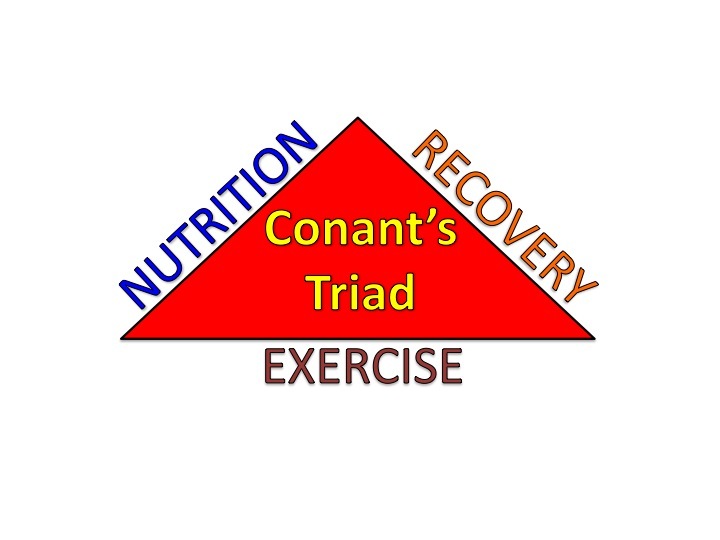 I call it the Conant Triad. To be successful at your fitness goals it is important to establish balance among nutrition, exercise, and recovery. If any of the walls of the triangle are neglected then the triangle will collapse. Each side of the triangle depends each other for support. When designing a program all three aspects are equally important. You might have a great exercise routine and eat well, but you don’t recover properly. Therefore, you will get run down and eventually provoke an overtraining effect. If you exercise and recover well but don’t eat well then you will not see results. If you recover and eat well and fail to exercise correctly then you will fail. It is all about staying balanced and following a program that works. 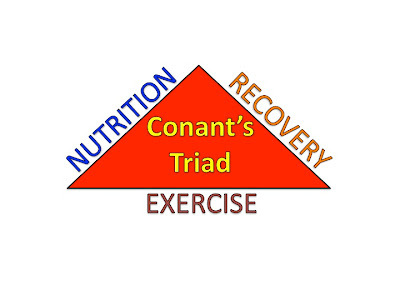 And that is what Conant’s Triad is all about. What is your goal? Do you just want to go through the motions and dwell in mediocrity, or do you want to excel and take your fitness to whole new heights? To get to new heights takes tremendous discipline and know how. You must decide if you want to see results or continue going down the road of mediocrity. To truly see change in your body takes a complete change in lifestyle. You must live it everyday….